Habit: Annual [perennial herb, shrub], glabrous or hairy. Stem: prostrate to erect. Leaf: simple, generally basal and cauline, alternate, opposite, or whorled, entire, (fleshy), petioled [not]; stipules 0 or small, deciduous. Inflorescence: axillary or terminal cyme [umbel] or flowers 1; flowers pedicelled or not. Flower: generally bisexual, small, radial; sepals 4--5, free or fused, persistent; corolla 0 or small (= staminodes); stamens 2--25, free or fused basally, on hypanthium, alternate sepals, petal-like or not; nectary a ring; ovary superior, chambers 3--5, placentas generally axile, styles 1 or 3--5, generally free. Fruit: 3--5-valved capsule [achene]. Seed: 1 or more per chamber, reniform to lenticular, arilled or not. Genera In Family: 14 genera, 125 species: generally tropics, subtropics, especially Africa. eFlora Treatment Author: Michael A. Vincent & Wayne R. Ferren, Jr. Habit: Annual [perennial herb], glabrous. Stem: prostrate to erect, slender, branched from base. Leaf: generally whorled, linear to oblanceolate; stipules +- 0. Inflorescence: axillary, terminal, cyme, umbel [flowers 1]; pedicel 3--30 mm. 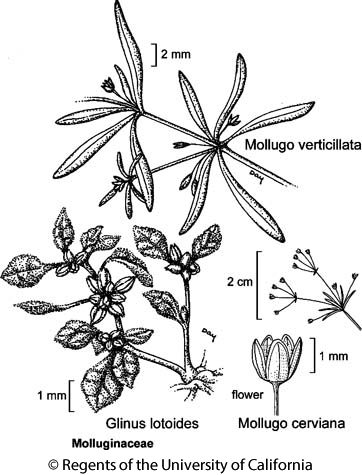 Flower: sepals 5, free, margins +- scarious; petals 0; stamens 3--5, fused basally; styles 3--5, linear. Fruit: 3-valved, included in calyx. Seed: many, reniform, smooth, ridged, or finely net-sculptured; aril 0. Species In Genus: 35 species: tropics, subtropics. Etymology: (Greek: soft or pliant) Note: Worldwide revision of genus needed. Habit: Annual, glabrous, glaucous. Stem: 3--20 cm. Leaf: in whorls of 4--10, 3--15 mm. Inflorescence: flowers 3--4. Flower: sepals 1--1.5 mm, elliptic to ovate; stamens 1 mm; stigmas 3, sessile. Fruit: +- spheric. Seed: brown. Chromosomes: 2n=18. Jepson eFlora Author: Michael A. Vincent & Wayne R. Ferren, Jr.
Citation for this treatment: Michael A. Vincent & Wayne R. Ferren, Jr. 2012, Mollugo cerviana, in Jepson Flora Project (eds.) Jepson eFlora, http://ucjeps.berkeley.edu/eflora/eflora_display.php?tid=33880, accessed on April 19, 2019. SnJt, D; Markers link to CCH specimen records. Yellow markers indicate records that may provide evidence for eFlora range revision or may have georeferencing or identification issues. Purple markers indicate specimens collected from a garden, greenhouse, or other non-wild location.